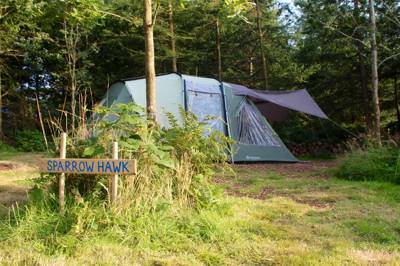 We have a large camping field with no boundaries or pitch numbers, if you prefer to keep it simple. There are spectacular views from everywhere onsite and a cracking sunset everyday. 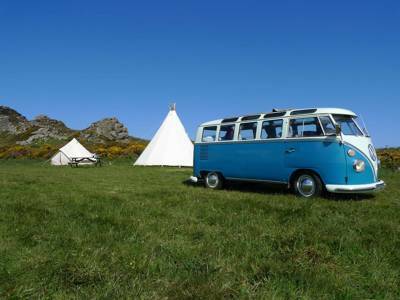 There is plenty of room for traditional camping, touring caravans and camper vans. 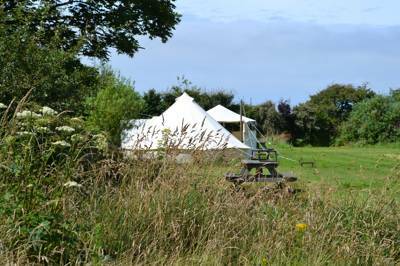 We have a field with electric hook up points, water facilities and washing up area. This campsite will have you dancing a little jig of joy as soon as you’ve stepped foot on its delightful ground. 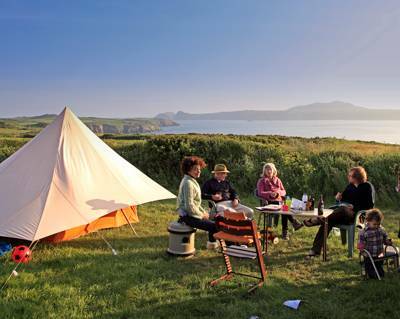 Nuzzling the shores of the Irish Sea, the gaping National Trust land on which the farm and campsite reside offers knock-out views along the coast as well as direct access to the Pembrokeshire Coast Path and a sheltered swimming cove. Owner Ian is a softly spoken guy who greets campers with warmth and ease. He and his wife Judy opened the site back in 1992 with just a tiny green corner of grass for campers. 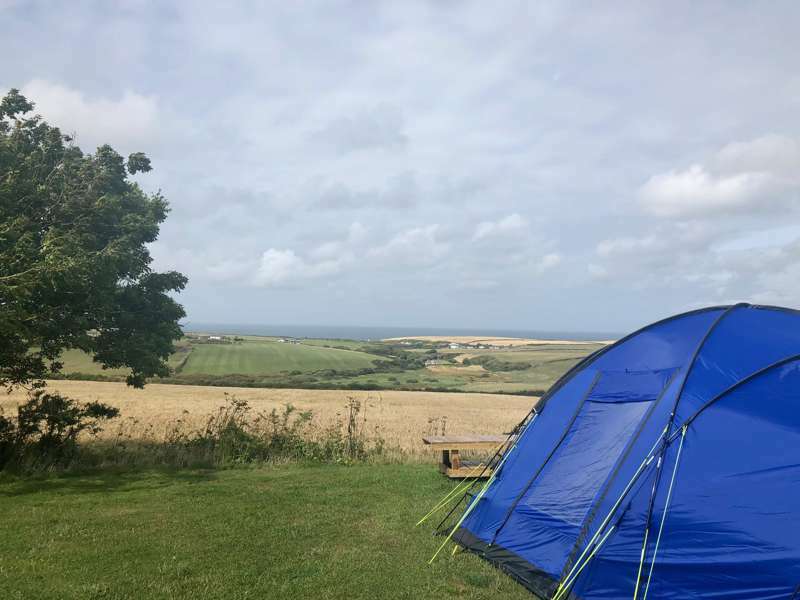 Since then he’s added a flat terrace with electrical hook-ups, situated even closer to the coast, for families and, because two is never a crowd, a third field – huge, undulating and guarded by a magnificent army of hawthorn bushes – has also been cleared for camping. The farm’s evolution didn’t stop there; its diminishing outbuildings have also been transformed into an impressive facilities block, while barns have become year-round holiday accommodation, activity and dining spaces, or cosy, ivy-clad bunk houses. 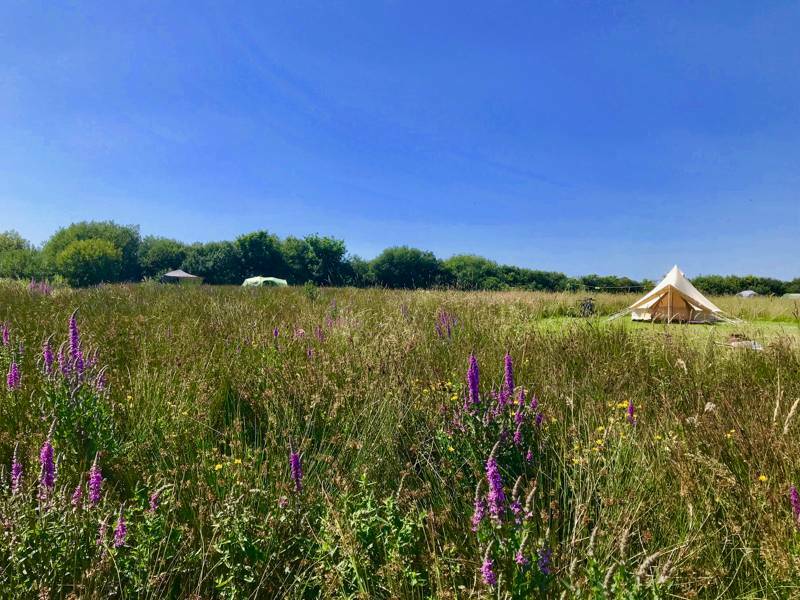 The camping meadows have almost become a footnote to the rest of the farm’s great holiday offerings, albeit the sort of footnote that you’ll instantly remember and will return to again and again and again. 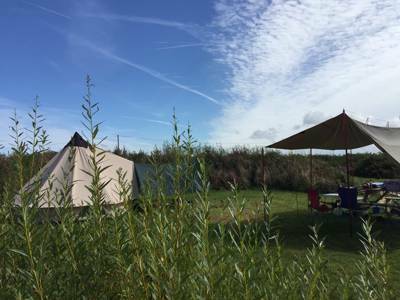 At Celtic Camping you have space to breathe, space to play and space to relax on our Pembrokeshire camping site. 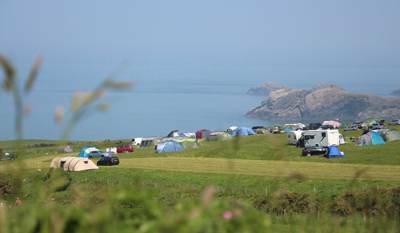 Set in 250 acres of open farmland, you can enjoy knockout ocean views, our own little beach of ‘Aber Pwll’, easy access to the ‘Pembrokeshire Coastal Path’, which runs directly through the farm and a wealth of stunning local activities. 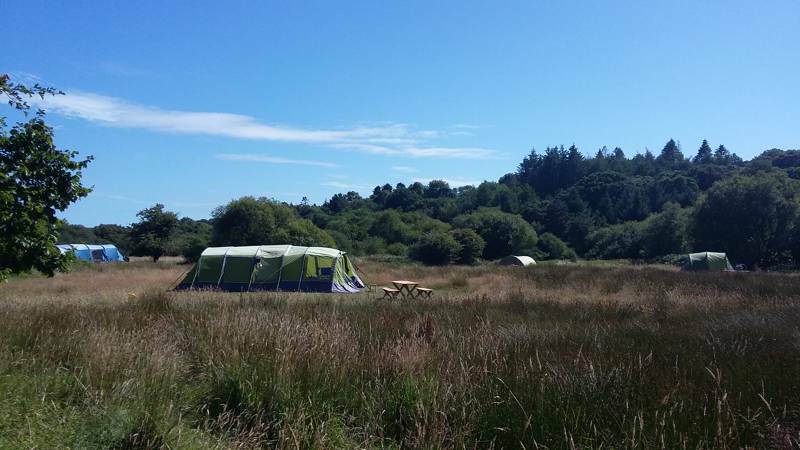 For latest availability and best prices for Celtic Camping and Bunkhouses, please use the Date Search above. 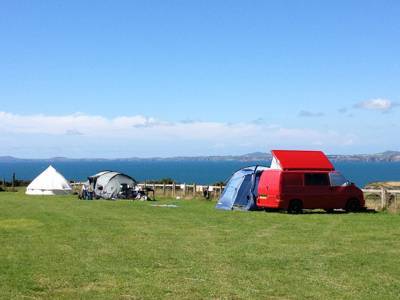 Open, 'free-range' camping pitches, plus a handful of more formal, electricity-supplied spots. Bunkhouses also available. 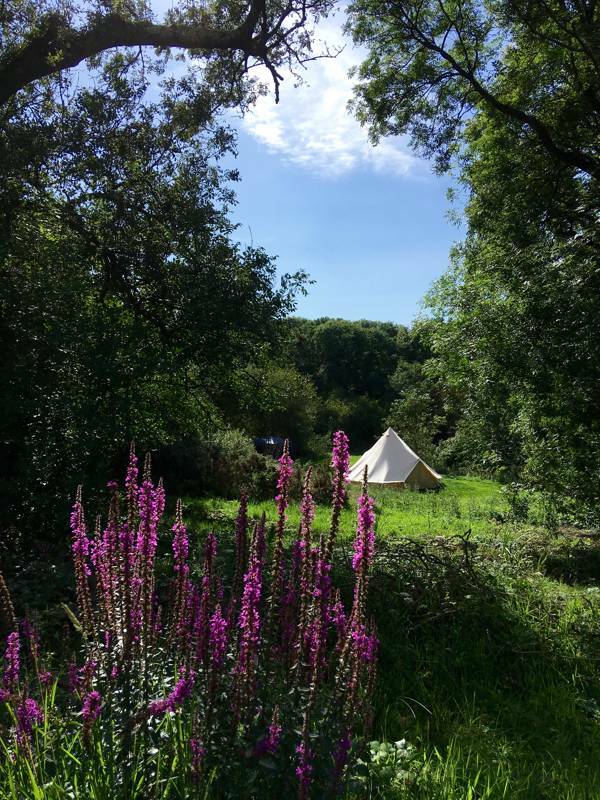 3 camping fields, with something to suit everyone: the flat family field has hook-ups while the third field has plenty of space for groups. Fires are allowed off the ground: firepits can be borrowed. 2 wash blocks – the main one has super-hot showers and rows of loos; the other block is more rudimentary, but close to the family field. Family room and disabled-access room. Plans for another facilities block are also pending. Barn with covered picnic benches and washing-up sinks. Drying room. Bunkhouse accommodation also available on-site. Bushcraft courses available, on which you’ll be trained in how to cut down logs and make fire or go down to the field by the pond to build rafts. Ponies and pigs on the farm. Just get wetter with TYF Adventure (01437 721611) based locally in St Davids. They offer all sorts – from coasteering (they invented it) and surfing to sea kayaking and climbing. Voyages of Discovery (01437 721911) do RIB rides to the north Pembrokeshire Islands and whale and dolphin watching. On site, take a look at the graffiti wall in the Stage Room adjacent to the barn. Farm machinery and the on site pond (although this is ringed by a fence) to be mindful of, and you’re on a cliff-top. The pebble beach is a 10-minute walk away – just off the coast path. It’s small but has rockpools and is good for swimming. Or ramble along the Pembrokeshire Coastal Path for just over 30 minutes towards Abereiddi’s famous Blue Lagoon. Don wetsuits, bouyancy aids and helmets to fling yourselves off the cliffs there and shute down waterfalls: Celtic Quest Coasteering (01348 837337), recently awarded Best Visitor Experience in Wales by the national tourist board, are based in Abereiddi and will take you out for around 2½ hours. You can pre-order brekkies (which feature the farm’s home-produced sausages and bacon), packed lunches and evening meals (when available). Amble along the coastal path to the famous Sloop Inn (01348 831449) at Porthgain harbour. As well as your standard meal times they offer an hour of Bacon Sarnies from 11a.m. till noon and an afternoon menu from 3–5p.m. so you’ll never go hungry. 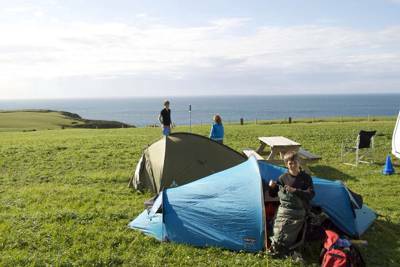 Camping (Tents, Camper Vans, Motor Homes, Caravans): adult £10 per night; child (5–15 years) £5, under-5s free. Electric hook-up £5. Campfires starter kit will cost £10, nets of logs thereafter £5 each. Dogs (well behaved) £2 per dog are welcome too. Bunkhouse beds range from £24 per person per night - self catering (B&B or Full Board options available) - please phone for availability or contact us via email. Take the A487 into St David’s and head north out of the city on Nun Street. Take the first left (before the rugby club) and continue along the road for 3½ miles, passing Pembrokeshire Sheepdogs and the nursery. Celtic Camping is on the left, down a track. Take a train to Haverfordwest and from the bus station there hop on the Puffin Shuttle (no. 400) to St David’s, then the Strumble Shuttle (no.404), which will drop you off near the site on request. 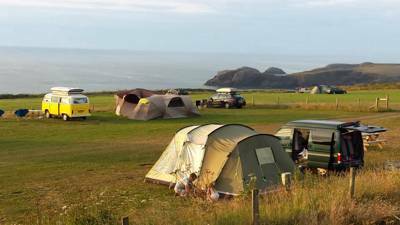 Celtic Camping is 4 miles from St David’s.